Norway votes to end the union with Sweden. 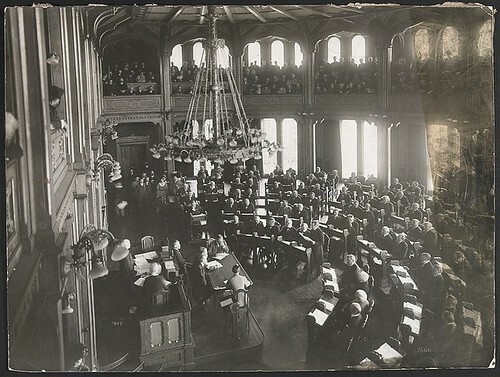 The dissolution of the union between the kingdoms of Norway and Sweden under the House of Bernadotte, was set in motion by a resolution of the Norwegian Parliament on 7 June 1905. Following some months of tension and fear of war between the neighboring nations and a Norwegian plebiscite held on 13 August which overwhelmingly backed dissolution negotiations between the two governments led to Sweden’s recognition of Norway as an independent constitutional monarchy on 26 October 1905. On that date, King Oscar II renounced his claim to the Norwegian throne, effectively dissolving the United Kingdoms of Sweden and Norway, and this event was swiftly followed, on 18 November, by the accession to the Norwegian throne of Prince Carl of Denmark, taking the name of Haakon VII. The plebiscite was held on 13 August and resulted in an overwhelming 368,208 votes in favor of confirming the dissolution of the union against only 184 opposed. It is one of the most lopsided referenda in history. The government thereby had confirmation of the dissolution. 85 percent of Norwegian men had cast their votes, but no women as universal suffrage was not extended to women until 1913. Norwegian feminists however collected 279,878 signatures in favor of dissolution. Polar explorer Fridtjof Nansen weighed in heavily for dissolving the union and traveled to the United Kingdom, where he successfully lobbied for British support for Norway’s independence movement. This entry was posted in Uncategorized and tagged 13 August, 1905, dissolution of the union by admin. Bookmark the permalink.